New programs meet needs and bring people together. It’s no secret: Parenting is hard. A recent needs assessment found moms in Clackamas County, Oregon, felt isolated and alone. They wanted a place to meet other moms, seek advice and make new friends. With many of the respondents living in low-income apartments that surround the Cascade Divisional Headquarters (DHQ) building, and the fact most social services are many miles away, The Salvation Army added services to its Clackamas Ministry Center that operates out of the ground level of DHQ. Brandi was one of them—until she brought her family to a community event and got connected to the Clackamas Ministry Center. 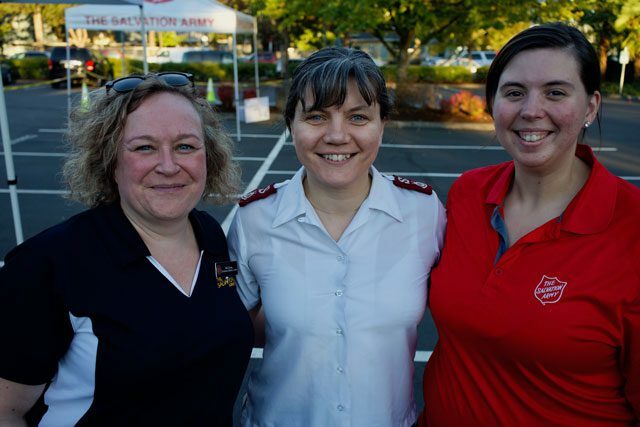 Pictured are Nikki Pooley (r) and Kathryn Opina (l), Program Assistants for Clackamas Ministry Center, and Major Anya Henderson, Clackamas Ministry Liaison Officer. Top: Major Anya Henderson’s daughter at a recent CMC event. Brandi’s kids now participate in music lessons and the Kids Club, two of the new programs hosted at the CMC. The new programming spreads throughout the week. On Tuesdays, children can participate in free music lessons after school, since those who responded to the survey shared they would drive up to 15 miles to find affordable music lessons. On Thursday mornings, the CMC hosts a play group where moms can meet while their kids play. The CMC also offers a monthly Family Night Out, which has already experienced growth. “This program is a program a lot of families need out here because you can’t find programs like this that are available to low income families,” Brandi said. While the effort is still new, Pooley said Brandi’s family attends regularly, and also brings other families’ children, too.